Who says concrete needs to be boring and gray? 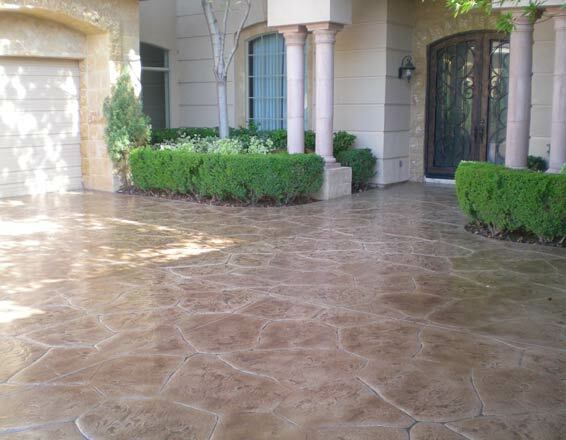 As one of the leading patio stain companies in Houston, TX, we offer endless options to customize your concrete patio and transform it into a one-of-a-kind work of art. Concrete stains are an affordable way to resurface concrete that’s showing its age or just add a colorful decorative element to your patio or poolscape. We don’t just stain concrete patios; we can also stain flagstone, concrete pavers, and more to give you the backyard you’ve always dreamed of having. Don't settle for boring. Give us a call to discuss options to bring your backyard vision to life with high-quality concrete stains and dyes that offer long-lasting results for concrete patios, pavers, flagstone, and more. A stained concrete patio in Houston can be an elegant and timeless look that works well with any home style or landscaping. While a traditional gray concrete patio looks sterile and cold no matter how much effort you put into landscaping, a stained cement patio perfectly complements the look of your backyard and adds a custom touch. 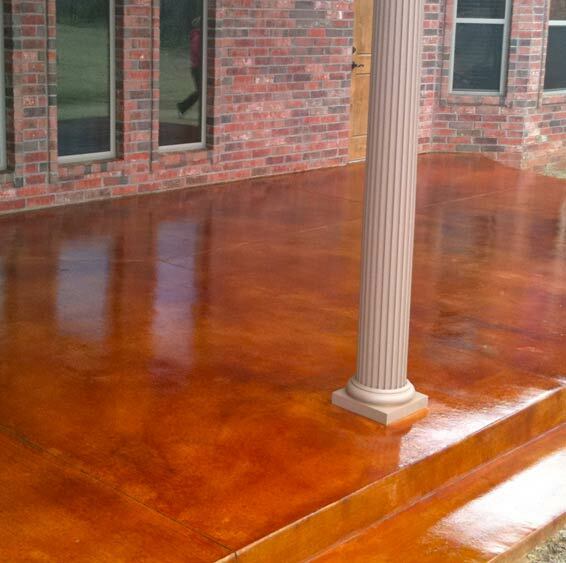 We serve Houston homeowners with affordable and reliable concrete staining. We take pride in our superior customer service and decades of experience working with concrete stains and dyes with the expertise necessary to deliver the results you are looking for. No matter what type of patio you have, we probably have the products and techniques to deliver a new, custom look. Want to give your flagstone patio or concrete pavers a facelift? The same products we use on concrete patios can also be used to stain pavers, flagstone, and stamped concrete. A flagstone patio is an elegant addition to your home, adding a beautiful natural appearance that’s hard to achieve with concrete. Still, you don’t need to settle for the light gray and tan shades of your flagstone, especially as the color fades over time. Staining a flagstone patio is a cost-effective option to give your flagstone a brand-new look with vibrant color that sets off your landscaping and home. Flagstone is a great material for staining because it’s porous enough to absorb the stain. We use water-based stains to impart your choice of colors in your flagstone surface. After staining, we use a quality sealer to protect the flagstone and ensure long-lasting results. We can also stain concrete pavers with the same acid-based and water-based stains or concrete dyes we use on concrete slabs. We will recommend the best product to use for staining concrete patio pavers in Houston depending on whether your concrete pavers are sealed or unsealed. Acid staining a concrete paver patio is recommended for sealed pavers, even integrally colored pavers. If you’re tired of your standard red or gray pavers, we can give you the look of bluestone, add a rich antique finish, or change the color completely.